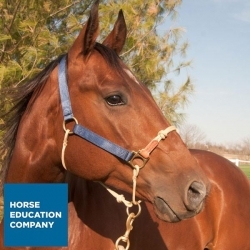 A Classic Nylon Hybrid Horse Halter for Training Horses and Ponies. Made from High Quality Nylon in the USA. Black in Colour and Available in Various Sizes. Can your halter do it all? The PATENTED Horse Education Classic Nylon HYBRIDHalter® can. It is a direct combination of the traditional flat halter and the natural horseman's rope halter, with the addition of a signature 180° sliding ring and noseband knots to allow for the precise application of pressure and leverage - resulting in unbeatable lightness in the halter without the use of a stud chain. Use one halter for training, trailering, farrier work, leading in and out of the stall... you name it! You can cross tie in the Hybrid, you can do ground training in it. You can take it on and off like a bridle without undoing any knots or buckling any buckles simply by undoing the throat latch snap and sliding it over your horse's ears like you would any bridle. The HYBRIDHalter® can also be used as a bitless hackamore for riding: attach snap end reins to either the D's of the halter, or to the 180 degree slide ring, based on your individual preference. This Classic Hybrid Halter is a perfect fit for all sizes of horse or pony as it is available in the following sizes: Please see the size chart below. To Measure - Measure your horse or pony from the bottom of the cheek bone over the poll to the bottom of the opposite cheek bone and then add 5cm's. Classic Hybrid Horse Halter - Made from the Finest Quality Materials but Affordable!